As a small child my parents used to take us to the library in Altrincham every Saturday. At that time it was in quite a grand old stone building with big steps up the front and I can remember sitting on the floor of the children’s library in a pool of sunlight reading the next Bill Badger book. I then found the sun and the peace in the library for the rest of my youth – until at 16 I was working there at weekends, and again when it moved up the road and before I went to university. This library is the key to my inner life. I could spend ages navigating the morass of connectivity that brings me to now, over 50 years later. Then, my parents could not have afforded to buy us books; as a teenager – and as a student – I would spend hours in bookshops only to leave without buying. The public library was essential. It still is for loads of people – as you are finding. Now, whilst I am still working, I will carry on buying my books – rather them than expensive ‘holidays’. When I have to retire, and again have no income – I would hope libraries will be there again for me – but probably not if the Tories’ attitudes to the public realm continue to hold sway. They’re a tragic bunch, aren’t they? Thank you, David. 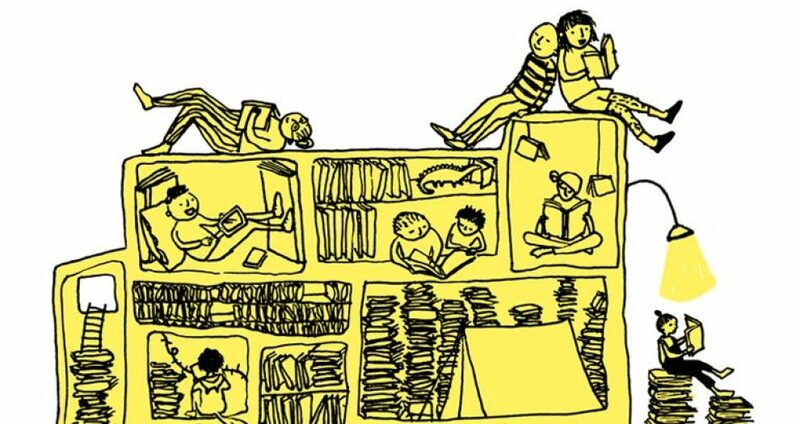 This memory is wonderfully descriptive – reading in the pool of sunlight… And generally a super illustration of how libraries can be so important to our lives. We hope to contribute to the case for libraries, to show their value, and there seems to be lots of support out there so I like to imagine that libraries (although not so many, sadly) are here to stay at least for a while yet. Thanks again very much for your comment. Who would ask for them for a further or third time, Not my elder sister. A picture inserted here and there was not enough to erect any story house, To the un-ventured adult side the books were even harder as kilned bricks. Coaxed off their dried pages with tracing fingers and gazing eyes. For what words does the archivist scroll and loop, In the dancing shadows of brilliance. Are there any tales of loyalty, courage and dedication to be requested, Or are the loftier shelves of the newly arrived to be held and leafed. I wrote this as a birthday gift to my sister, I hope it brings some further pleasure.